In order to advance our understanding of the potential of cannabis as a medicine, it is helpful to look back through history at the many times and places that this plant has emerged into the local materia medica. Cannabis may be set for an archaic revival as modern science is now exploring the neuroprotective qualities discovered by emperor Shen Nung close to 4500 years ago. 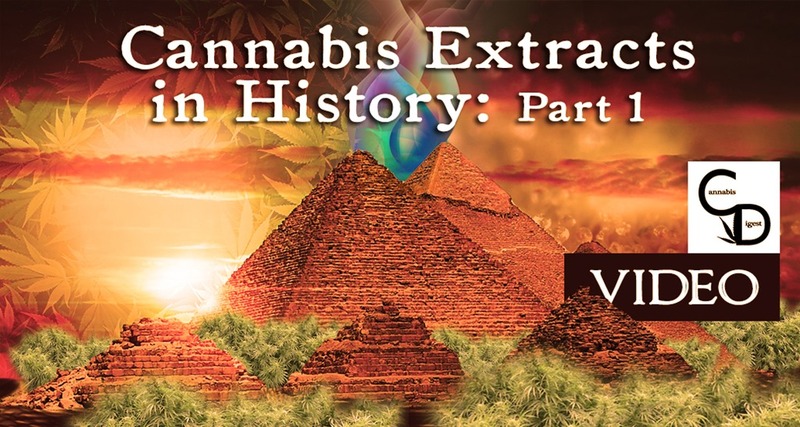 This Article is complimented by short videos made by myself and Ted Smith to accompany his Textbook, Hempology 101: The History and Uses of Cannabis Sativa. 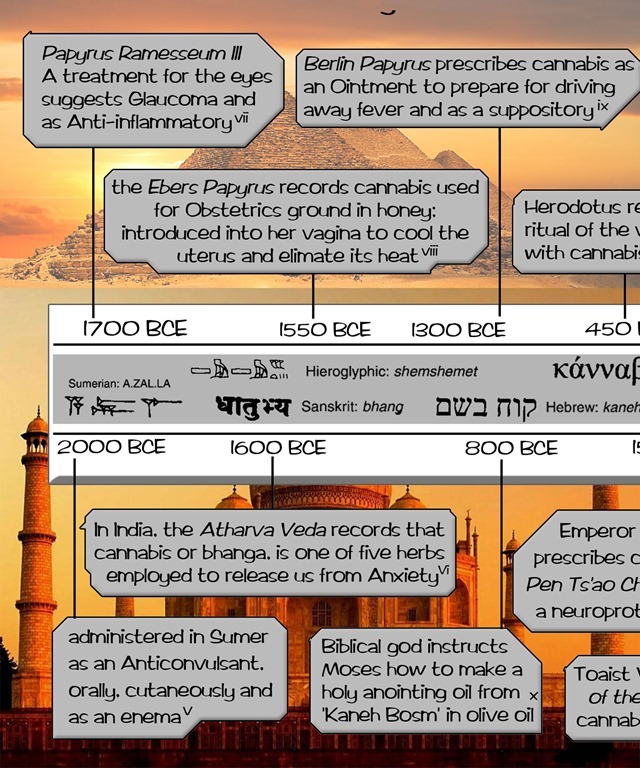 You can find sources for all of the references to ancient texts that mention cannabis extracts here. With wild cannabis growing in abundance, ancient medicine makers began to develop basic techniques to separate the desired ingredients from the crude plant matter. In the extensive review, History of Cannabis and Its Preparations in Saga, Science, and Sobriquet, Dr. Ethan Russo determines three categories of herbal cannabis: Bhang, Ganja, and Charas. Bhang is referred to as a mixture of flower, seed, leaf, and stalk; Ganja is the manicured, seedless, “feminized,” “sensimilla” flower buds alone; and Charas is resin collected by simple techniques, commonly known as hashish. Ancient methods of gathering Charas include washing or beating the plant over fabric screens, or just rubbing the plant to gather the resin on one’s hands or body. Clay tablets found in the ancient city of Nineveh represent the collected medical knowledge of the first two centuries BCE in Mesopotamia. These document the early use of cannabis or A.ZAL.LA as an anticonvulsant taken orally, cutaneously, and as an enema. These ancient doctors utilized all parts of the plant to treat an extensive list of conditions from impotence to nocturnal epilepsy. 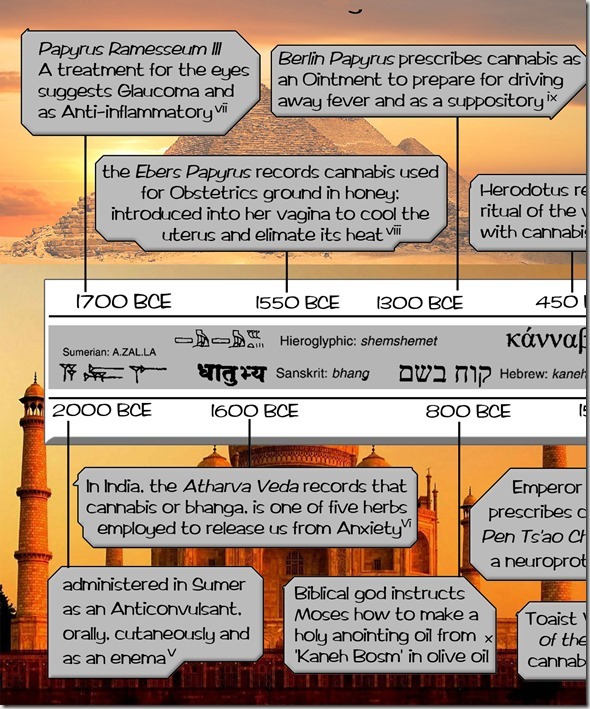 In nearby India, an early Ayurvedic text, the Atharva Veda, exalts cannabis or bhanga as one of five herbs employed “to release us from anxiety.” The ingredients of the legendary Vedic holy drink Soma are hotly debated among academics. 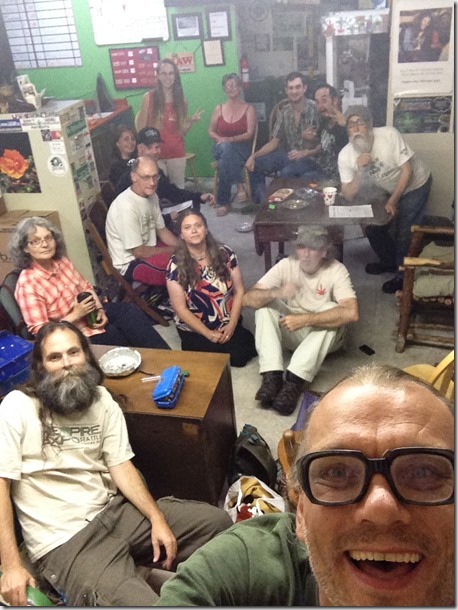 Author and historian Chris Bennett supplies compelling evidence for the inclusion of cannabis in his book Cannabis and the Soma Solution. Cannabis drinks have been popular for tens of thousands of years. Chris uses archaeological and etymological evidence to illuminate cannabis as a consistent ingredient in ritual beverages—techniques advancing from ancient times when the oil from the seeded flowers of wild cannabis were crushed and pressed after becoming enriched with the oil soluble cannabinoids, to advanced techniques for cultivating feminine cannabis and extracting the cannabinoids into forms of hashish. It is still common in Egypt to use steam distillation to produce a cannabis flower essential oil rich with therapeutic terpenes as a scent for perfumes, cosmetics, soaps, and candles, and to add sweetness to baked goods and candies. The essential oil is anti-fungal and can also be mixed with water and sprayed onto plants for protection. Although the varieties of cannabis used in today’s products are low THC, this method could be applied to medicinal grade cannabis. 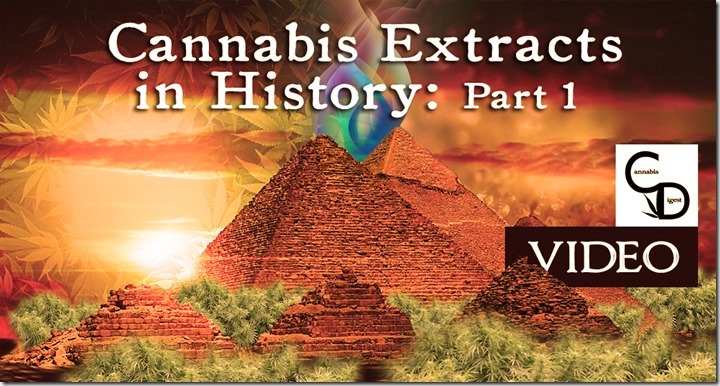 This is only the start of a four part journey through the history of Cannabis Extraction. Stay tuned to the Cannabis Digest Blogs and watch out for Part 2 by Owen Smith next week. Next article Do you have the ‘Time 4 Hemp’ ? Georgia Toons – Man Made or God Made?